Butterick 4825; ca. 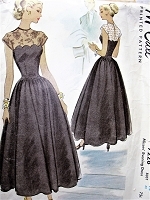 1949; Misses’ Bouffant Dress: Strapless Bodice. “Romantice” Bouffant dress, beautiful for dancing. The fitted subtly draped bodice is strapless. The gathered eight-gore skirt has a sheer overskirt in front; cascade drapery rippling across the front and down either side.